We have been wearing turquoise gemstones for at least five thousand years, in necklaces, bracelets, rings, earrings and brooches. And that’s not all. This exquisite blue stone has been used in sculpture, masks, weapons, and even on roofs. Here we provide you with just a little of fascinating story of this wonderful gem. A common belief shared by many civilizations was that turquoise possessed the ability to prevent disease, and it was thought to change colour according to an alteration in the wearer’s health, and also to provide protection from adverse forces. Of course, turquoise does change colour, but this is generally caused by the application of heat, or contact with various substances. Ancient Egyptian rulers and leading citizens were fond of adorning themselves with turquoise jewellery, and deposits on the Sinai Peninsula, at Serabit el-Khadim and Wadi Maghareh, were probably operating between 3000 and 2000 BCE. The Egyptians made their popular goddess, Hathor, responsible for these turquoise mines and added the title, Lady of Turquoise, to her long list of honours. Crafts persons in the ancient Indus Valley Civilisation (Pakistan, India), which thrived from 3300 to 1300 BCE, fashioned turquoise into tubular or barrel shapes and decorated them with carvings, bands, dots and patterns, or set them in gold, before stringing them into gemstone necklaces. Chinese artisans inlaid turquoise into jade, bone and ivory carved, stylised sculptures of humans and animals during the Shang Dynasty of 1600 to 1046 BCE. Early Persians, from at least 600 BCE, believed turquoise represented the heavens because its blue colour looked so like the daytime sky, and they used it to cover the domes of palaces and places of religious worship. The Aztecs, as well as other Pre-Columbian Central American people, considered turquoise sacred, and inlaid it, with other gemstones and precious metals, into ceremonial mosaic objects such as sculptures, masks, knives and shields. The illustration shows a turquoise mosaic-decorated, two-headed snake, representing the serpent used by the god of fire and sun, Xiuhtecuhtli, to chase the moon from the sky each morning. This sculpture was given by the Aztecs to Cortez in 1519. 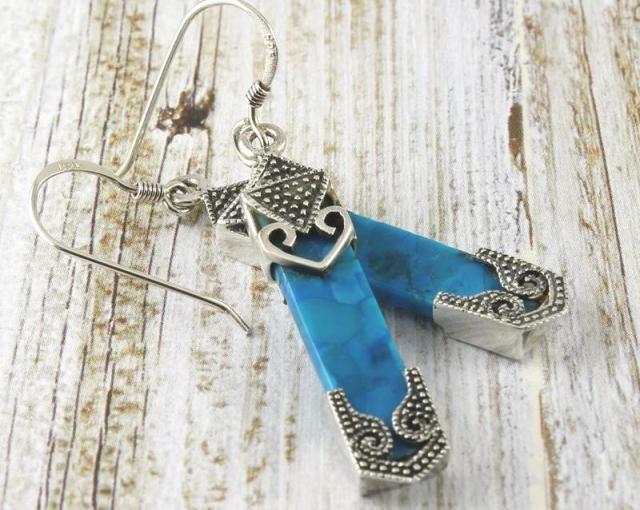 Ancestal Puebloans, Navajo, Apache and other peoples from the south west of North America used turquoise for protective amulets, or attached it to their hunting weapons, since it was said to improve accuracy. They also used turquoise in mosaics, sculptural works, and fashioned it into beads and pendants. 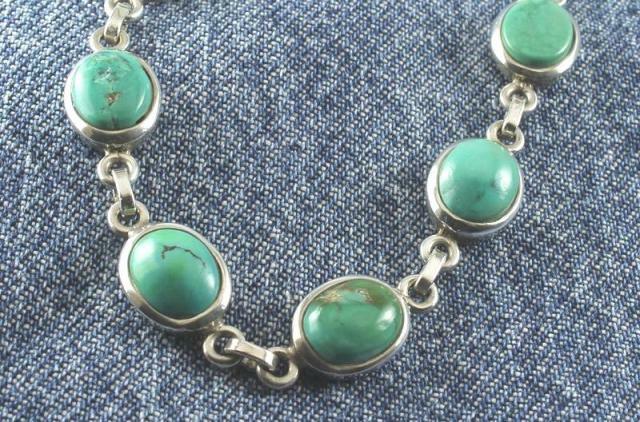 Turquoise was also a source of wealth that could be used for trading. 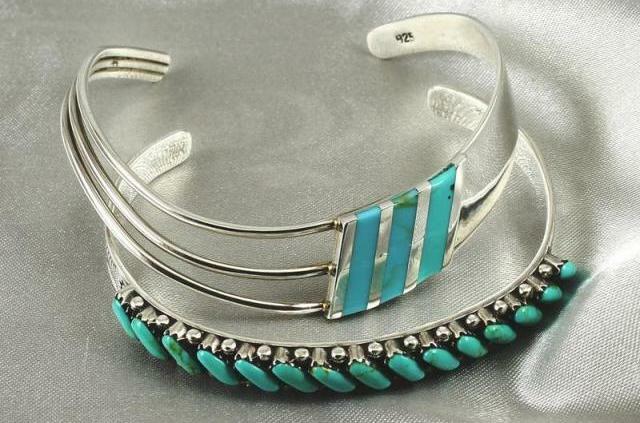 The distinctive turquoise and silver jewellery produced by south western Native Americans, is believed to have originated in the 1880s as a result of European influences. Turquoise did not feature significantly in jewellery or the figurative arts in Europe until the increase of global trade around the 17th century. As European interaction with Asia and the Middle East increased, traders brought a wide range of gemstones, including turquoise, back to Europe. 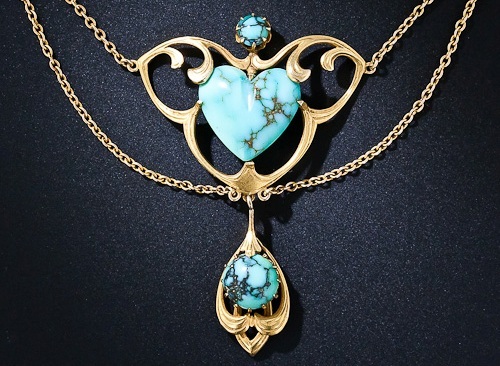 Soon it became fashionable for European women to wear turquoise gems, and the jewellery of the Victorian era (1837—1901), and of the Art Nouveau period (1890-1910), with its emphasis on the colours of nature, often featured turquoise stones. Turquoise entered Europe via the trade routes that passed through Turkey, and since the French believed that Turkey was the country of origin of the gemstone, they called it ‘pierre tourques’ (Turkish stone). A shortened derivative of this, turquoise, soon caught on everywhere. Turquoise is rarely found in well-formed crystals, but usually as an aggregate of microcrystals. When the microcrystals are packed closely together, the turquoise has a lower porosity, greater durability, polishes to a higher lustre, and is not so much vitreous or glassy but more waxy or sub-vitreous. 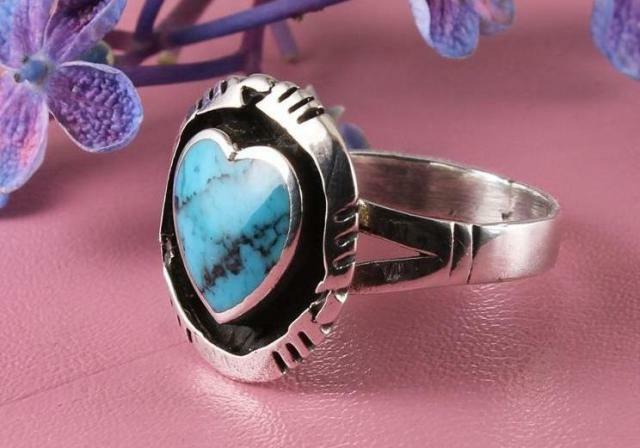 Turquoise forms best in an arid climate, and this determines the locations in which it’s found. Rainfall filters down through soil and rock, dissolving small amounts of copper. When this water evaporates, the copper combines with aluminium and phosphorus to deposit tiny amounts of turquoise on the walls of underground fractures. 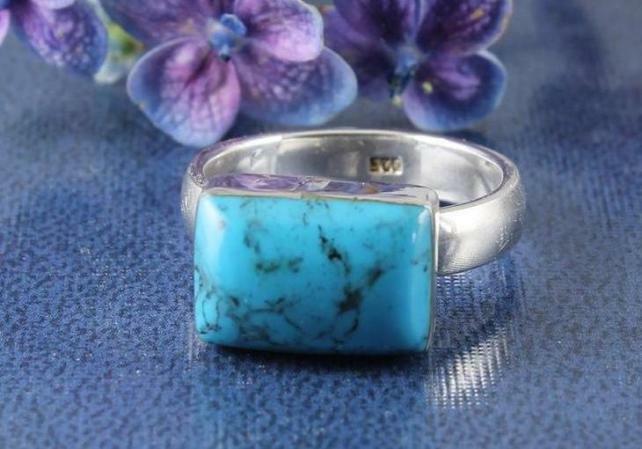 Turquoise can also replace rock that comes in contact with water. If the replacement is complete, a solid mass of turquoise will be formed. When the replacement is less complete, the host rock will appear as a patterned matrix within the turquoise. Turquoise is not very tough, being rated as 5 to 6 on the Mohs scale of mineral hardness (in a range from one to 10). Lower Mohs numbers indicate a higher propensity to be scratched by a harder mineral, while higher numbers indicate better scratch resistance. The best Turquoise is a little harder than window glass, while many stones can be quite soft and porous. As a result, turquoise is often surface-hardened by soaking with artificial resin, which also deepens the colour. This accentuation of colour is similar to the effect of spraying water on a stone, with the colour becoming a little brighter. Colour can also be improved with oil, paraffin, Prussian blue, aniline colours, or copper salt. The highest quality turquoise is found in northeast Iran, near Nishapur, which is also where some of the earliest known mines were located. Other deposits are found in Afghanistan, Argentina, Australia, Brazil, China, Israel, Mexico, Tanzania and the US. Blue minerals are rare and this partially explains why turquoise captures attention in the gemstone market. Everyone loves the blue sky, and this is the other part of the story of turquoise’s popularity. The colours of turquoise can vary from a rich sky-blue to light aquamarine, but it can also come in a range of greens and teals. The colour varies according to the minerals found in the area. The presence of more copper leads to a bluer gemstone. More iron leads to a greener gemstone. Pure colour is rare and turquoise stones are mostly interspersed with brown, dark grey or black veins of other minerals, known as matrix, which derive from the host or mother rock. 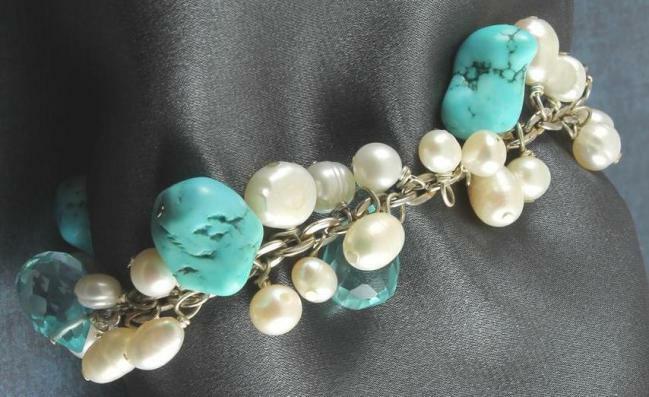 In Western culture, turquoise is the traditional birthstone for those born in the month of December. 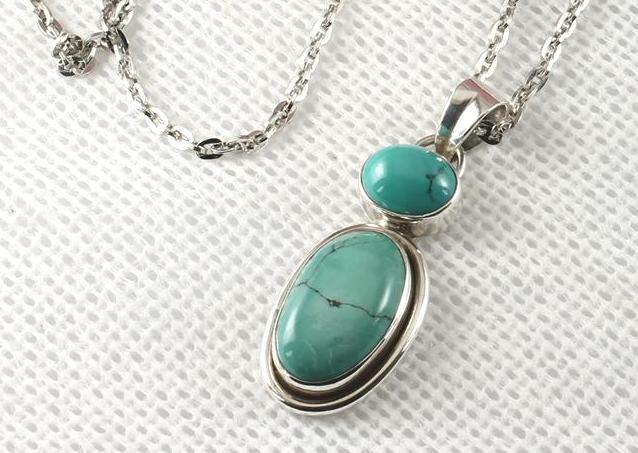 Being a relatively soft and somewhat porous gemstone, turquoise should always be treated with care. 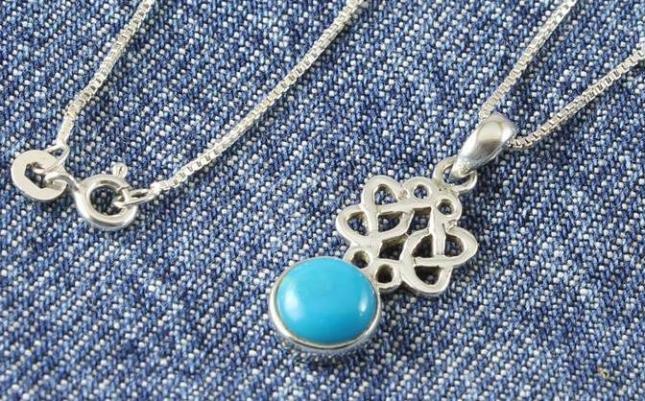 Turquoise jewellery should be stored wrapped or placed in pouches or plastic bags, to prevent it from being scratched by harder stones in your jewellery box. Wash turquoise jewellery lightly with mild soap and water, and dry with a soft cloth immediately. Never have it ultrasonically cleaned. Try not to expose turquoise to excessive sunlight, or to cosmetics, perspiration, oils (including the oils secreted by the skin), or household detergents. Always remove a turquoise ring before washing your hands. 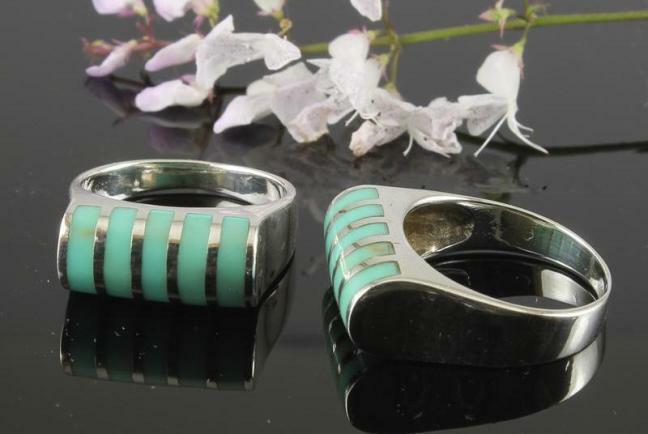 The loss of the natural water content of turquoise can bring about a change of colour. 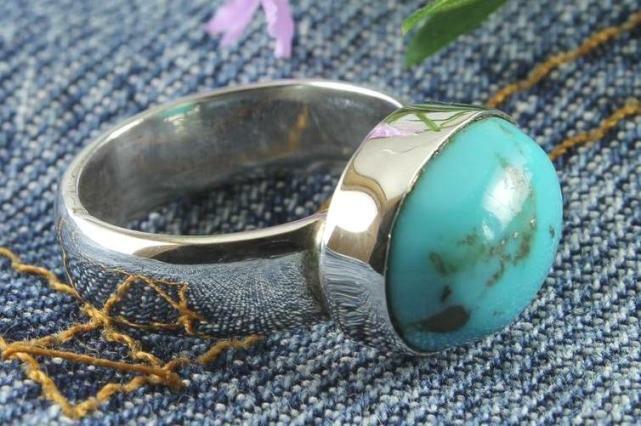 Since blue turquoise will change to a dull green at a temperature of around 250 degrees centigrade, care should be taken by designers and crafters when setting stones using a soldering of other heat process.